"I will do what needs to be done." Time to take a look at an unusual new thriller titled Locke, starring Tom Hardy, set entirely in one car. In the film, Hardy plays a construction manager driving home from his job who deals with a number of stressful phone calls all entirely inside his car (a nice BMW) while he's driving. It's surprisingly engaging and oddly entertaining for a film about someone taking phone calls in their car, but that's what makes this such an impressive original creation. This is one of those must see it to believe it unique concepts for a film, and it's actually pretty damn good. This dream-like UK trailer does a good job of setting up the concept, but it's not the best trailer for this indie film. That said, it's worth watching anyway. Ivan Locke (Hardy) has crafted a nearly flawless life. Professionally, he is an obsessive perfectionist, respected by his coworkers and loved by his bosses. He cherishes the bond he shares with his two sons and the unshakeable partnership he has developed with his wife. This is the life he always imagined, an ideal existence built with painstaking care. Hours before the biggest day of his career, Locke receives a phone call that threatens to destroy the life he has worked so meticulously to create. As he struggles to keep his world intact, he is forced to confront his imperfections and the fractured foundation where they are rooted. 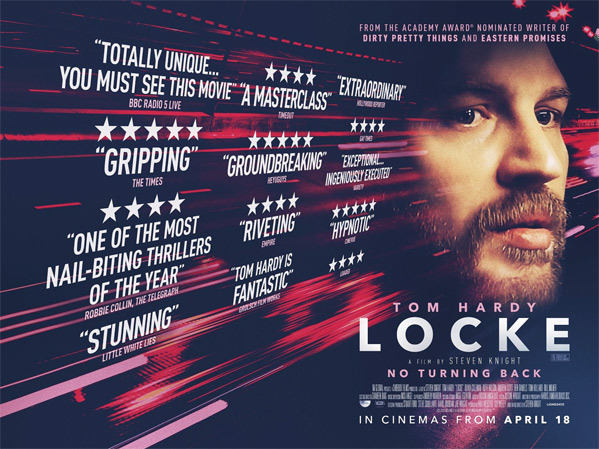 Locke is written & directed by British filmmaker Steven Knight, screenwriter of Dirty Pretty Things and Eastern Promises, jumping into directing again following his first feature debut Hummingbird with Jason Statham. Steven Knight's Locke first premiered at the Venice Film Festival in late 2013 before playing at Sundance 2014. A24 Films will be releasing Locke in the US and has set an April 24th, 2014 release date. Stay tuned. I think Tom Hardy is so incredibly talented. I can't wait to watch this. He is honestly one of the most talented in the industry right now. I'm hooked! Does anyone know when the new Mad Max will appear? Dying for that.